Ruben in t'Groen, Netherlands, 2000's. 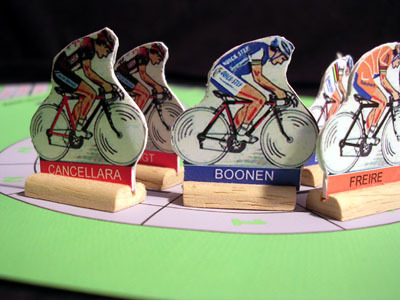 Since Homas Tour was so popular in the Netherlands (even before the "Um Reifenbreite" release), it is normal that it had different home made variations. 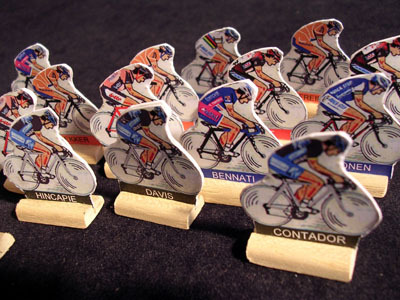 However, Homas Tour Pro (aka HTP) is not a simple variation. It is different enough from the original to be considered a new game. Ruben in t' Groen (yes, that's his real name!) 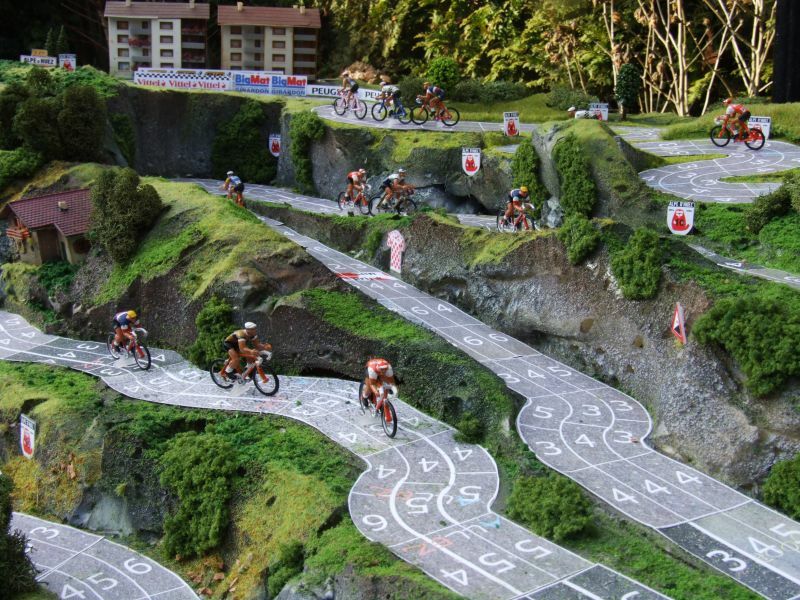 has developped a fantastic set of rules which take Homas Tour quite far. I have had the pleasure and honour to play it against Ruben, Jürgen (who stole the win from me in the last minute... congratulations!) and Rob Bontenbal (creator of the original Homas Tour). The game is quite complex, and I must admit that without Ruben being present I would not have been able to play all the rules. 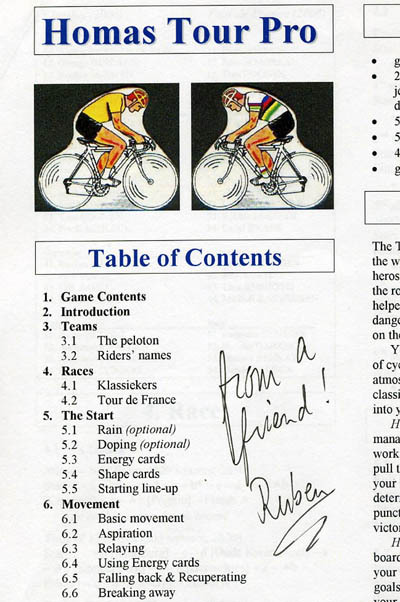 But maybe that was because the English translation of the rules was uncomplete (that was some years ago, now there are even Spanish and Italian translations). The most outstanding idea in these rules is the behaviour of the neutral teams. 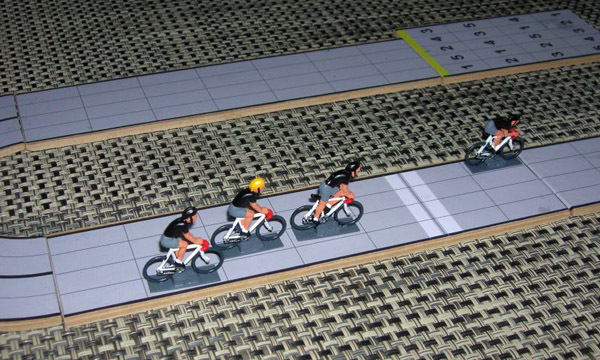 Neutral/virtual teams (not driven by any player) are in the back of the minds of many modern cycling game designrs (see the -unfinished- text New Directions In Cycling Board Games), and the neutral teams in HTP are the best so far. They are so good you can even play this game alone. 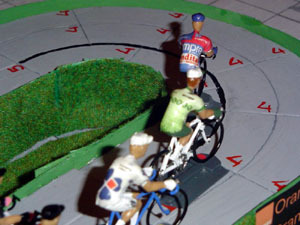 (Stage races adapted for solo play are available for download). I should really try to spend some time on this game and write something else about it. It really deserves it. 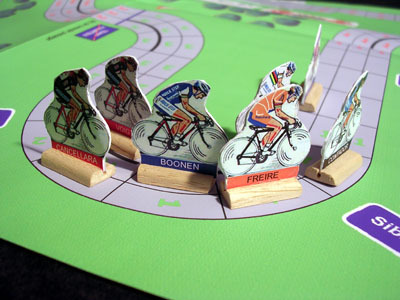 Ludo Nauws also likes Homas Tour Pro, and he has developped new boards (and self-made cyclists) to play some classic races. 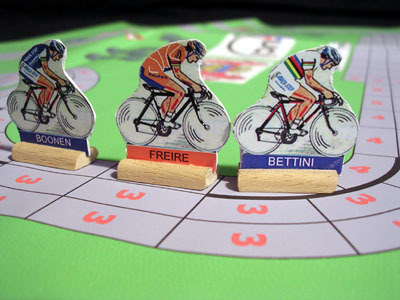 So far he has Ronde Van Vlaanderen and Paris-Roubaix. 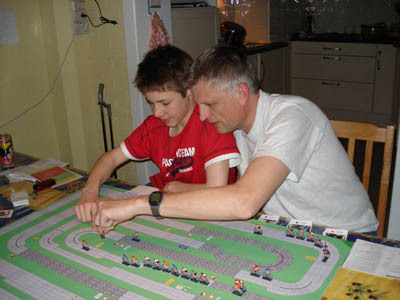 Ludo and his son Tom playing on one of their home made boards. Looks like there's quite a lot of people playing Homas Tour Pro. 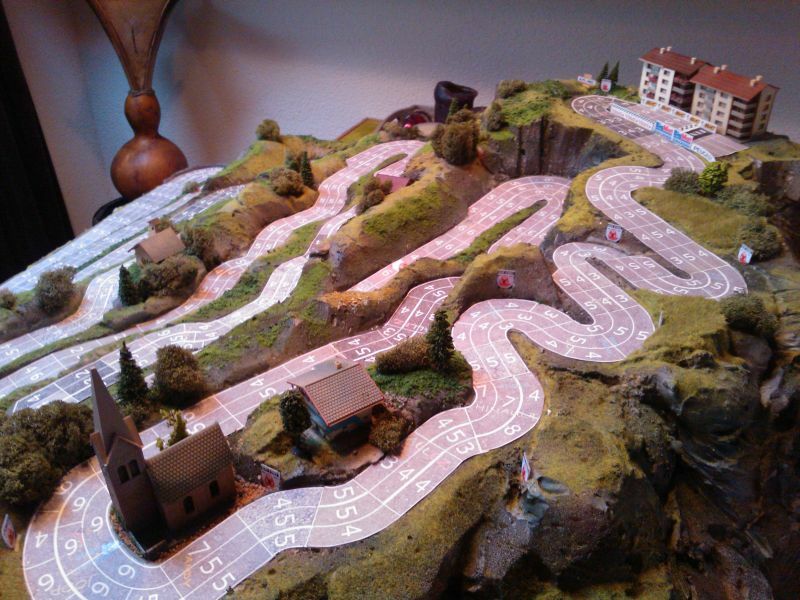 This is Pieter's huge self made board. Ludo Nauws keeps doing nice work. 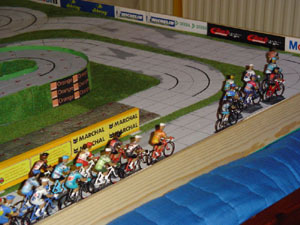 These is a new set of riders using Fonderie Roger's small figurines, and hardboard (4mm thick) track parts for a Tour de Belgium starting in September 2009. Learn more about this project here.